There it was, on the corner of South Street. 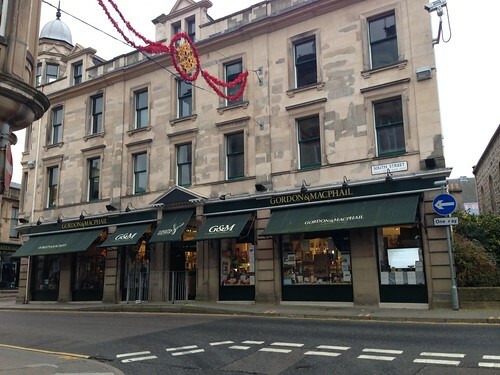 The old building where it all started in 1895 when James Gordon and John Alexander MacPhail opened the Gordon&MacPhail's family grocery store. John Urquhart joined them to assist with the whisky side of the business. After J.A. 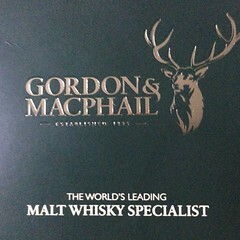 MacPhail retired and James Gordon died, John Urquhart became senior partner. Nowadays the shop is still owned by members of the third and fourth generation of the Urquhart family. The shop was already open when we walked by. Our point of interest, the whiskyroom, however was closed untill 10.00AM. It's prohibited to sell alcohol before 10.00AM so we had te come back later that day. For now we just had a look around in the rest of the shop. The old characteristics of the grocery store are still recognisable in the sales range. Chocolates, cheese, meat as well as coffee, tea and hot chocolate can be found. Oh well, that's not what we're here for. Off to Benromach and back to the store after that! Peter had done a little research before we went to Scotland. He had seen a very special bottle on the website and we decided that bottle would come home with us. After half an hour searching for it in the whiskyroom we gave up. We just couldn't find it anywhere, only in the shopwindow. 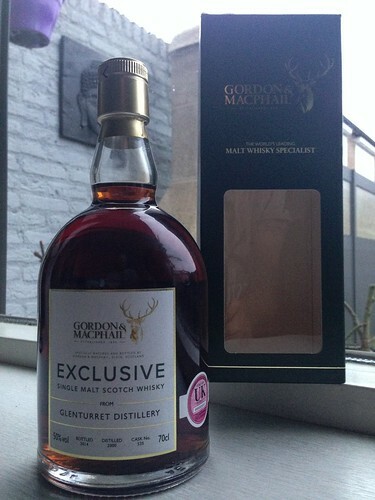 Two bottles of the Gordon&MacPhail Exclusive were asking us to please take them home with us. Easier said than done... We found out that this Exclusive was only sold in combination with a luxury Christmas hamper. As much as we like Christmas and some of the other products in the hamper, we just wanted the whisky. At last, after asking again and again and yet a third time, one of the employees gave us a small sample to nose and taste while he would go and see what he could do for us. Five minutes later he came back with two dark green boxes holding two bottles of the Exlusive! Bottled at 50% ABV this 13yo Glenturret whisky was matured in refill sherry hogshead with casknumber 535. Non chill filtered and bottled at it's natural colour in only 366 bottles, two of them came back home with us. Of course we wouldn't want the employee to get in trouble but he'll know we're very gratefull for his help when he reads this blog. We'll both treat it as a Christmas present when we open the bottle later this month.